I love roasting butternut squash, but when I'm short on time or my oven is otherwise occupied, this is an easy way to make a tasty side dish on the stove top. Plus this particular recipe is mild enough that even the kids like it. 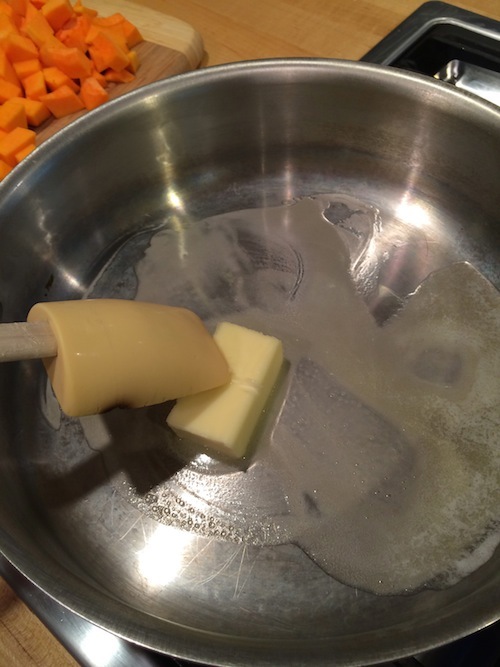 Melt the butter in a large pan over medium-high heat. (I think I need a new silicon spatula! 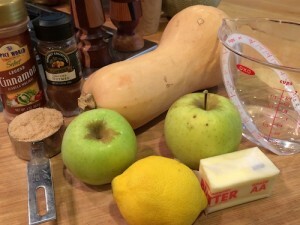 )When the butter is melted, add the squash, apple, lemon juice and water.Cover and cook until most of the liquid has been absorbed and the squash is tender. (Approximately 5-7 minutes.) Stir in the rest of the ingredients and heat for another minute or two until the sugar has dissolved.I completely forgot to take the glamor shot of the squash on our dinner plates (serve with pork loin! ), but I know you all have great imaginations, so I'll depend on that!